For me, Guitar Pro has been a key tool in getting the ideas in my head down to “paper”. 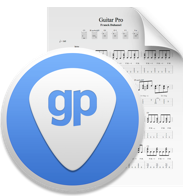 In the multiple bands I have been a part of over the years, Guitar Pro has been the center of our writing process. Usually the guitarist I’m working with will tab out their part, send it over for me to listen to, and then I add my drum parts to it. However, you may be in a situation where you don’t have a drummer yet. Maybe you need to program your drum parts for your project. Or maybe you need to explain to a drummer what ideas you may have for certain part but can’t physically show it yourself. That’s where this lesson comes in. This Guitar Pro lesson is geared toward the singer/songwriter that doesn’t fully understand how to notate drums and wants to improve their songwriting workflow. As a first lesson, I geared the beats toward simple Rock and Metal songs. It is constructed in a way to first assist in understanding what a drum part can do to a song and provide a different feel. It then breaks into alterations of a beat. These can all be easily manipulated by simply copying and pasting different parts into your song, as well as adding or subtracting notes here and there. The first three beats are basic Rock beats. A standard time feel for a rock beat in 4/4 would place the snare drum on beats 2 and 4 (as seen in the first beat). This provides the listener with “stability” more or less, as it is very common to place snare hits here. The second beat shifts the snare for a double time feel. This places a snare on beats 1,2,3 and 4. This raises the energy of the song, giving the song an added push and, sometimes, build. The third beat is the half time feel, placing the snare on beat 3. Half time beats usually take up 2 measures to complete a phrase. Where a standard Rock beat may finish in one measure, with 4 total beats and the snare on 2 and 4, a half time beat would take 8 beats. Placing the snare on beat 3 of both 4/4 measures provides this laid back feel. The next two beats are typical standard and half time feel break down beats. Similarly to the initial set of beats, the slight move in snare placement changes the feel. These work great for big sounding chorus sections of songs as well. We then shift into typical metal beats; Straight 16th notes blasting on double kick drums to start. The example in the lesson is written in half time (snare on beat 3) but like the initial set, that snare placement is your choice! Play around with the snare to get the feel you need. The next example introduces what I call “flourishes”. Basically, these are “fancy” quick feet patterns added into a straight pattern. In the example here, since it’s initially written in 16th notes, the flourishes take the shape of 32nd notes. These can be rearranged as needed. Add or subtract more to get the sound you like. For Death Metal players, I included the basic blast beat template as well as the “Hoglan Blast”, created by Gene Hoglan. The Hoglan blast is usually reserved for a very heavy, intense sounding part of the song, and all hits are in sync together. Fairly straight forward to write out. The Trot beat is a commonly used beat in Rock and Metal music. It gives off somewhat of a “Hot for Teacher” vibe. It’s also referred to as a gallop, as it resonates similarly to how a horse sounds when galloping. Finally, there is a straight 8th note triplet beat and a second one with flourishes to add more texture to the beat. All of these beats, as mentioned before, can be easily manipulated simply by adding or subtracting notes as required. I hope this template helps with your creative workflow. Look out for more lessons like this in the future, as well as lessons that go in depth with my writing process. Andrew Minarik is the current studio drummer of the metal band Threat Signal and founding member of the upcoming super group The Aggregate. He has been fortunate enough to be a part of multiple All Country Jazz bands through his 16 years of playing as well as recognized as an alternate in New York States All State Jazz Band. With over 11 years of professional training, as well as 9 years of teaching experience himself, he strives to share as much knowledge as he can to rising drummers and musicians to help them create and grow. Any chance you could do some demo/tutorials for hard rock/ metal guitar? I do understand drum notation but will still enjoy these. 😀 Thanks! And yes, I did appreciate the other guitar riffs and licks too! Thanks! I love blues as well. Could you provide gpx files for this as well? I have guitar pro 6 so I can’t open the file..
Hi Roman, I have just tested the links and they are working fine. You can try to download the files with another browser maybe. Thank you.